The number of articles written about vitamin D toxicity has steadily declined as more and more doctors learn about vitamin D. One way to learn about vitamin D toxicity is by reviewing data from the U.S. Poison Control Center. 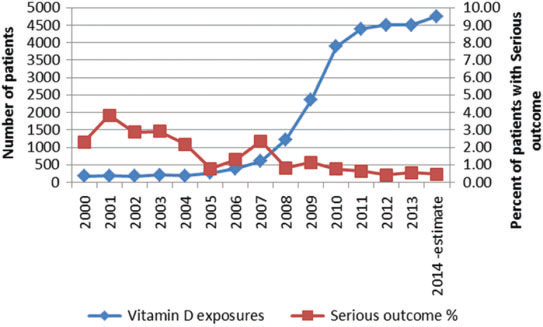 Spiller HA, Good TF, Spiller NE, Aleguas A. Vitamin D exposures reported to US poison centers 2000-2014: Temporal trends and outcomes. Hum Exp Toxicol. 2015 Oct 30. From 2000 through 2014, there were 25,397 calls to poison control about overdoses of vitamin D (Figure). There were about 200 calls/year in the year 2000, which has increased to more than 4,000 calls per year recently. During that 15-year period there were only three serious cases of vitamin D toxicity, but no deaths. Figure: Number of patients who consumed vitamin D and percent with serious outcome by year. Do you know how many people died from Tylenol toxicity during that same time? About three thousand. Of the five serious medical cases involving vitamin D, two were from aspiration problems in infants when vitamin D drops went down the windpipe. The three serious adult cases were: 1) 55-year old male, chronic ingestion causing agitation, confusion, electrolyte abnormalities, renal failure and seizures; 2) 78-year-old male, chronic ingestion causing lethargy, electrolyte abnormalities, renal failure and respiratory depression; and 3) 53-year-old female with chronic ingestion causing elevated creatinine, renal failure, electrolyte abnormality and hypertension. Doses taken were not given. As far as suicide attempts, 106 people tried using overdoses of vitamin D to kill themselves, though none succedded. All of this was well understood by at least one person back in 1999. Professor Reinhold Vieth, in his classic paper, wrote about the safety of human vitamin D preparations. If you are only going to read one paper about vitamin D, read his. It was this paper that converted me to the importance of vitamin D and sparked the initiation of the vitamin D revolution.